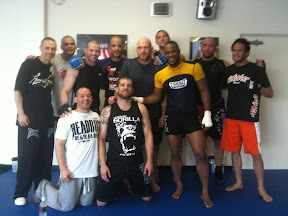 Jon Chaimberg, Rashad Evans, Keith Jardine, Shane Carwin, Amal Easton, Chaun Sims, James McSweeney, Cody Donovan, Brendan Shaub, Trevor Wittman, and me. It was a great day of sparring. Coach Amal ran us through some sweet guard passes too.